Siemens presents Sirius 3SK1, a flexible and modular range of safety relays. The component portfolio has been greatly reduced simplifying selection and use. For example, different basic units are no longer required for mechanical and electronic sensors. 3SK1 is part of Siemens' Safety Integrated concept. The safety relays are offered for monitoring and control systems with simple safety requirements, such as emergency stop or protective door monitoring. The product range takes the form of a clearly structured modular system so that plant operators can quickly, simply and economically assemble an appropriate and safe configuration. The Standard and Advanced basic units are available with relay or semiconductor outputs. The system portfolio is rounded off by modules with additional connections for actuators or sensors and a power supply. The Standard basic units are characterized by their simple handling and variable functionality. Both mechanical and electronic sensors can be connected to the safety relay by means of screw-type or spring-loaded terminals. DIP switches on the front of the enclosure can be used for parameter assignment so there is no need for software. Should there not be enough connections for actuators on the Standard basic unit, the user can flexibly connect additional output expansions from the modular system. The Advanced basic units feature all the product characteristics of the Standard version and not only allow the addition of modules with output expansions, but also of modules with input expansions for additional sensors. Another advantage of the Advanced basic unit: using device connectors developed by Siemens, the basic units and expansion modules can be quickly and simply plugged on without laborious manual wiring. That means there is no chance of any wiring errors occurring and commissioning is speeded up. 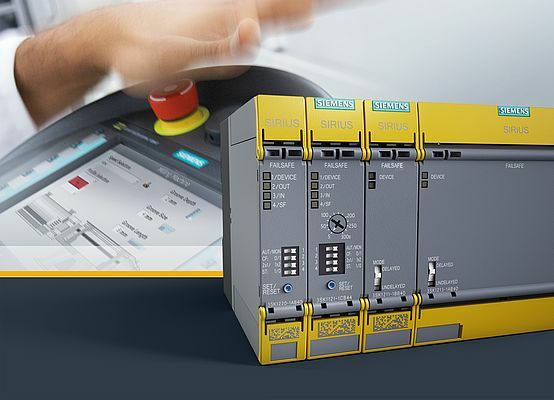 Siemens offers a version with a rotary encoder switch for applications that require a delayed safe disconnection of actuators. There is also a Mini version of the Advanced basic unit. At just 17.5 mm wide, the Mini is ideal for use in a confined space. The modules for the safety relays include an inexpensive input expansion and two output expansions. The input expansion for safety applications with more than one sensor has two inputs for mechanical or electronic sensors. Depending on the application concerned, up to five of these modules can be connected to one Advanced basic unit. Siemens offers two versions of the output expansions: 4RO has four relay outputs for currents up to 4 A; 3RO has three power relay outputs for high currents up to 10 A. All of the output expansions can be combined with both the Standard and the Advanced basic unit. Furthermore, an optional power supply is also available that covers all of the world's common control voltages and supplies up to six components on the device connector – whether basic unit, input or output expansion – with 24 V. The system's modular structure helps users to cut their procurement, storage and maintenance costs.